“Bob-white,” emphasis on rising second syllable. 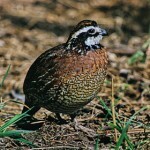 Description: Small, mottled brown body with cross-barring on belly and chestnut streaking on sides. White throat and eye stripe. 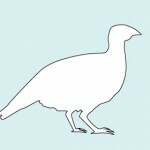 Small black or brown crest. Short gray tail. Female similar except eyestripe and throat are buffy. 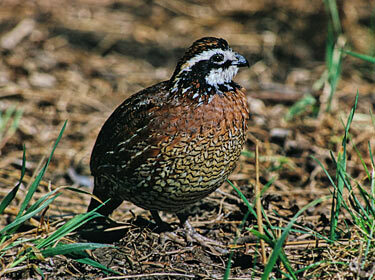 Habitat: Combination of grassy nesting cover, cropland, and brushy cover or woodland. Where in Nebraska: Common permanent resident across the state, becoming less common in the west. Common breeder in eastern and southern Nebraska, and in Sandhills along river drainages. Field Notes: Male helps to raise the family and will even incubate eggs, an unusual practice among Galliform birds. Fun Facts: Has 20 or so different calls grouped into four categories based on group movement, food-finding, avoidance of enemies, and reproduction (sexual and parental).